Our state-of-the-art 3D Ocular Coherence Tomography (OCT) scanning machine will generate a cross-sectional two-dimensional image of your eye. It’s then analysed to provide a three-dimensional image of the back of your eye. It’s a painless and non-invasive technique that takes only a few seconds. We store this image so that your eye can be monitored for changes in the future. 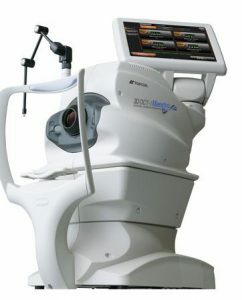 Potentially devastating eye conditions such as Macula Degeneration and Glaucoma can be determined by the OCT scanner.